The performer asks for the loan of three paperback novels, a piece of paper, and a pen or pencil. The performer says, "I have a feeling about one of you, and I think I have a pretty good idea about something that is going to be significant to you a little later on." The performer then writes something on the paper, folds it up, and hands it to one of the audience members. Three audience members are now selected to participate in the tests. Participant #1 selects a book, opens it up to a random page and remembers a word. The other participants, in turn, do likewise. However, the third participant does not even touch his book. He simply thinks of a word read from the book. No force. Turning to the 3rd participant the performer begins to slowly extract the word he is merely thinking of (oh, I should mention that the performer truly does not know what the word the 3rd participant is thinking of.). However, before all of that information is gotten, the performer turns to the 2nd participant and instantly tells him the exact word he is thinking about. This is a real freak out moment and will cause screams. The performer then turns back to the 3rd participant and after a bit more information is gotten from his mind the performer tells him the word he is thinking of. Now, for the final participant. The performer says, "Now, you are thinking of a word as well. However, remember before you even picked a book, I said that I had a funny feeling about you and that I wrote something down and said that it would be of interest to you later on. Guess what? It's later on. I don't know what word you are thinking of, but let's see if my gut feeling was right." The audience member, who has been holding the paper since the beginning, opens it up and shows what is written on it to the rest of the group. Written on the paper is the exact word the 1st participant is thinking of. 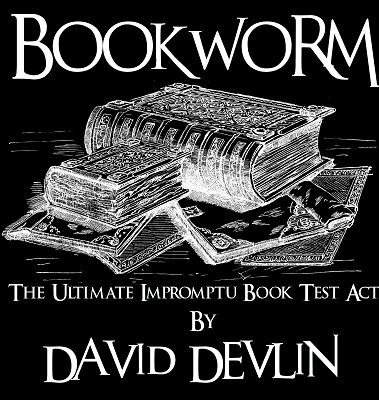 This is the book test act that David has held back for ten years. It is a very powerful act. And best of all, the entire act is totally, 120% impromptu. All of the objects are borrowed right down to the pen that you write your prediction with. This can be done anywhere and at anytime, even naked on a beach. There are no stooges, switches, secret devises, peeks, center tears, or preparation (well, there is a teensy weensy bit of preparation, but it takes less than 5 seconds, and is done right under their noses). The audience can examine everything before, during, and after the act as absolutely everything is borrowed. No gaffs of any kind are used. They can even frisk the performer if they wish. They will find nothing as there is nothing to find. This act truly is the ultimate act to use in any impromptu situation. In fact, this used to be a feature in David's full evening show. It is that powerful. Now, however, it is reserved strictly for impromptu situations. Oh, and the methods are easy to learn and you will be performing this in no time. Don't expect any completely new methods here, but the way they are put together makes this a very strong and powerful routine. 1st edition 2012; 2nd edition 2015, 13 pages. This book test is everything that David says it is in the advertisement. He has taken two separate book tests and very cleverly routined them to create a third. This is truly a blow away piece of mentalism when performed to lay people and would fool the vast majority of magicians also. The structuring is terrific and the test is suitable for private performances at a party in someone's house, on the radio or on stage or any stand up set. I tend to agree with David that it is strongest when performed impromptu I don't think there is a snowballs chance in hell of your participants or spectators being able to backtrack the method. I've performed the original two tests on many occasions over the years and when I read David's eBook it was one of those "Why didn't I think of that" moments! A fellow mentalist saw me performing this a couple of years ago and immediately bought it. To this day it is the only book test he is interested in performing. The reason I'm posting this review is that a couple of days ago a young mentalist I am friendly with contacted me to say that he had performed one of the tests in this effect at a birthday party the night before to very strong effect. I decided to recommend Bookworm to him and I was just checking for any reviews that had been published since I purchased it a couple of years ago. I discovered that Jeff Stone had posted a very positive review on You Tube.I had one issue with Jeff's review he mentioned that there is a one time preparation that you have to do that would take a few hours. In my opinion this is completely inaccurate, it is a very short memorisation that Jeff is referring to that should take no more than five to fifteen minutes even for someone who has no knowledge of memory techniques. At the price this an absolute cracker and I know for a fact that when I've performed it, it was talked about for sometime afterwards. I don't know David I've only ever been in contact with him once to leave feedback on how it played out in performance. I would highly recommend this book test.